There will be a lot of hype and hoopla, praise and stock taking this year of 2019 which marks, the 100th anniversary of Jack Roosevelt Robinson’s birth. 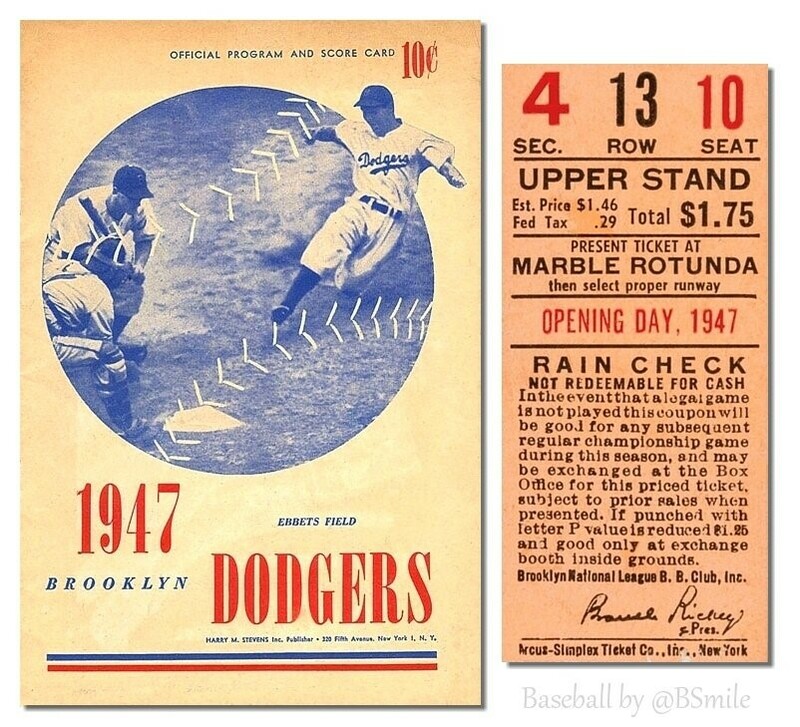 April 15 is a marker day in baseball – the dramatic day he broke baseball’s color line in 1947. This is the first of several pieces about him I will share with you. First always in being his own man, Jackie Robinson not only was “the first” to shatter Major League Baseball’s color line, he also racked up many other firsts in his lifetime. First on television to openly attack General Manager George Weiss of the Yankees the for lack of black players on the team , he was also first publicly to urge restaurants and hotels to accommodate black people and to end their segregationist policies. In 1959, he became the first major athlete with a nationally syndicated newspaper column, using it to discuss Civil Rights issues. Not a figurehead but a man with power, he was the first black vice president of an American corporation - Chock Full o’Nuts. He was also the first black baseball analyst as a member of ABC’s Major League Baseball Game of the Week, a position Howard Cosell secured for him. He was the first black player to have his uniform number retired. In 1972, the Dodgers retired Number 42. In 1997, another first -- Major League Baseball retired his uniform number across all major league teams. He became the first professional athlete in any sport to be honored that way. Another “first” happened on April 15, 2004, Major League Baseball adopted a new annual tradition, “Jackie Robinson Day.” Every player in MLB wears number 42. 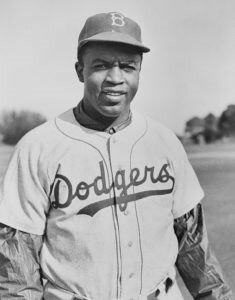 Pioneer, role model, symbol, outspoken, he not only re-made the face of professional baseball in America, he changed how many Americans thought about a black man in ways profound, subtle and at the same time obvious. “There I was the black grandson of a slave, the son of a black sharecropper, part of a historic occasion, a symbolic hero to my people. The air was sparkling. The sunlight was warm. The band struck up the national anthem. The flag billowed in the wind. It should have been a glorious moment for me as the stirring words of the national anthem poured from the stands. Perhaps it was, but then again perhaps the anthem could be called the theme song for a drama called The Noble Experiment. Today as I look back on that opening game of my first world series, I must tell you that it was Mr. Rickey’s drama and that I was only a principal actor. As I write this twenty years later, I cannot stand and sing the anthem. I cannot salute the flag; I know that I am a black man in a white world. In 1972, in 1947, at my birth in 1919, I know that I never had it made. One of the most prolific and respected sports journalists and oral historians in the United States, author of the autobiographies of legends Nolan Ryan ,Tony Dorsett, and Red Holzman, Dr.Harvey Frommer, a professor for more than two decades in the MALS program at Dartmouth College, was dubbed “Dartmouth’s Mr. Baseball” by their alumni magazine. 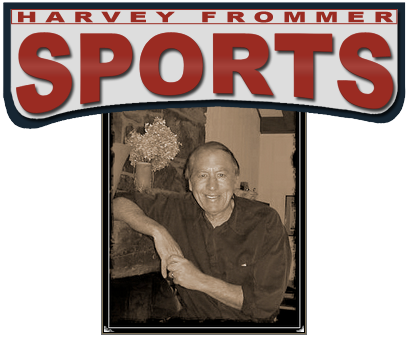 He’s also the founder of www.HarveyFrommerSports.com and has written extensively about Jackie Robinson.